Mauritania is the westernmost country in the Sahel region. Its location between Arab-influenced North Africa and Sub-Saharan Africa has created some ethnic divides and tensions between people of Arab origin and the indigenous populations. In other cases, the population has become united under a common belief; nearly all Mauritanians are Muslim. Most of the country is desert, making life in Mauritania difficult. In the past, northern populations were nomadic herders and the southern populations were sedentary farmers. Many continue these lifestyles today, but desertification and droughts have severely reduced the amount of fertile land in Mauritania.This has hurt herders and farmers. Many have had to abandon their lifestyles to attempt make a living in the cities. As a result, most Mauritanian cities are overcrowded and have high unemployment rates. While lifestyles may be changing in Mauritania, the hierarchical social structure is the same as it has been for centuries. In addition to the social divides, there are also significant ethnic divides. Ethnicity is complex in Mauritania and is also a source of tension. The White Moors control the country and other groups are resentful. In Mauritania’s short history as an independent nation, it has experienced periods of political instability and periods of long rule under one leader. 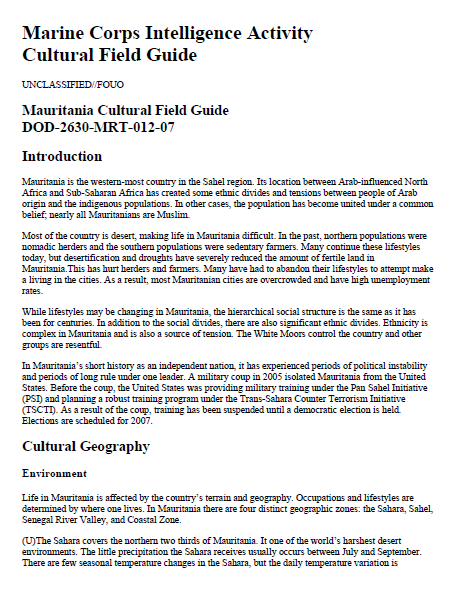 A military coup in 2005 isolated Mauritania from the United States. Before the coup, the United States was providing military training under the Pan Sahel Initiative (PSI) and planning a robust training program under the Trans-Sahara Counter Terrorism Initiative (TSCTI). As a result of the coup, training has been suspended until a democratic election is held. Elections are scheduled for 2007. Mauritania has a rigid social hierarchy hundreds of years old. The different social classes are often called castes. The caste system is complicated and differs between ethnic groups and clans. Membership in a certain caste is based on one’s occupation or the status of one’s ancestors. Mauritanians can usually determine someone’s class based on last name. The social structure differs between the ethnic groups. Generally speaking, among the Moors there is a noble class, a vassal class, and a servile class. The noble class is made up of warriors and religious leaders. Prior to the colonial period these two groups worked closely together. The warriors provided protection to the religious leaders; in turn the religious leaders provided moral support to the soldiers. Since the country gained its independence, these roles have changed and many of those who were once warriors have had to find other jobs. Even though many people in the upper-class are no longer warriors or religious leaders, the fact that their descendents were keeps them in a higher class. Below the warriors and religious leaders are those who were once vassals to the upper class. They are basically the general working class of farmers and herders. At the bottom of the social structure are the descendants of slaves, freed slaves, or servants. Afro-Mauritanians have a similar social structure, but there are more castes and tend to be a little less hierarchical. For example, there are castes for woodworkers, blacksmiths, cloth makers, herders, farmers, fishers, warriors, and administrators. Both Moors and Afro-Mauritanians hold blacksmiths among the lowest class. The rigidity of the social structure in Mauritania is problematic. In some cases, despite a person’s hard work or type of education, he is still unable to achieve a higher class. Some fear that this will create a sense of hopelessness that will make people susceptible to extremist propaganda. The social hierarchy is slowly beginning to fade as society becomes more exposed to other cultures and as more people are forced to take on different jobs to make a living. The divisions between classes are not often seen by outsiders and there is no government-sponsored discrimination against any one class. A typical meal consists of a starch (rice, couscous, pasta) and a meat (goat, sheep, camel) served with a sauce. Fish is also common and often mashed into a ball or dried. In general, vegetables are more commonly used in the south. Potatoes, yams, and onions are popular and often cooked into a stew. Afro-Mauritanian dishes tend to be spicier than Moor dishes. Tea is the most common drink, but milk (from goats or camels) is also popular. Mauritanian society is more collective than many Western cultures. What is good for the group is considered more important than individual achievement. People are expected to make personal sacrifices to improve the situation of the group or community. Decisions are often made through a group consensus. This collectivism also applies to possessions. Objects are often seen as belonging to a group and it is common to borrow or take items without asking.